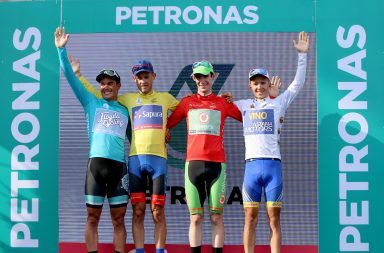 KOTA BHARU: Italian youngster Riccardo Minali took victory in an eventful Stage 2 of Le Tour de Langkawi 2018 from Gerik to Kota Bharu today that saw the Astana rider also take over the yellow jersey as the overall leader of the race from Bardiani-CSF’s Andrea Guardini, who won the opening stage yesterday. The 22-year old Minali, who joined Astana two years ago, won a bunch sprint of 79 riders, who formed the lead group after pre-stage yeloow jersey holder Guardini was dropped at the tricky climb to the Titiwangsa summit early in the stage. Minali, son of famous Italian sprinter Nicola Minali who won stages in the Tour de France, Giro d’Italia and Vuelta a Espana in the 90s, described this as a sweet victory. “This is my first stage win and my first yellow jersey since I turned professional with Astana two years ago. Today was a very tough stage, with the heat and a long climb early in the stage. But my teammates, especially Yevgeniy Gidich worked really hard in the peloton to chase down the breakaway and led me to the front for the bunch sprint,” said Minali. “I am not sure for how long we can defend this yellow jersey and the green jersey, but we will try to retain it until the finish. Guardini will surely be back in contention in the flat stages after this and I will try to compete with him to try and win the points classification,” Minali added. 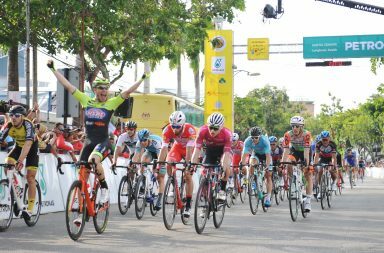 The lead group had caught six riders who had formed a breakaway across the two categorised climbs to form the group of 79 that arrived together at the finish in Kota Bharu, where Minali battled to win the bunch sprint ahead of Androni Giocattoli-Sidermec’s Matteo Malucelli and Bardiani’s Paolo Simion for an all-Italian top three. Minali’s group arrived at the finish in 5 hours 18 minutes and 20 seconds, about 13 minutes in front of the second group that contained many of the main sprinters in the race, including Guardini. The stage win also saw Minali replace Guardini atop the points classification lead, while Manzana Postobon’s Bernardo Albeiro Suaza took over the polka dot jersey from Hengxiang’s Wang Bo. Minali leads the general classification with a total time of 8 hours 47 minutes and 13 seconds, five seconds ahead of Joonyong, while in the points classificaton he holds 23 points, just for more than Guardini in second place. KSPO-Bianchi’s South Korean rider Seo Joonyong retained the Asian riders’ classification lead after maintaining his position in the front group. 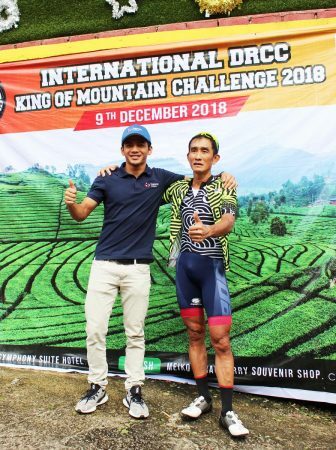 Suaza said the Manzana Postobon team, who are making the second consecutive appearance in LTdL, now have a better understanding of the race and its challenges. 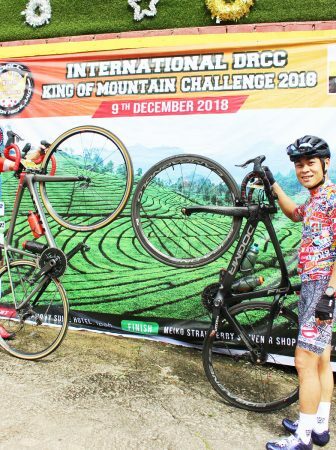 “Today I grabbed the opportunity at the climb as I targetted the polka dot jersey, but we are not sure how long I can hold on to it as we still have the toughest climb of the race in Cameron Highlands. 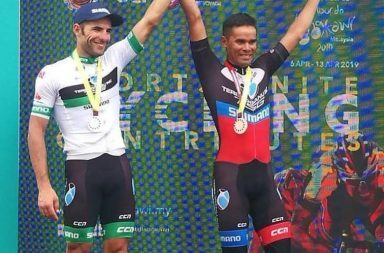 “But at least having the jersey now will inject a boost in morale for the team, which is considered a new team with young riders,” said Suaza, who now has 19 points in the mountains classification, just one ahead of Filipino rider Marcelo Felipe of of Team 7-Eleven. From the start in Gerik today, a group of four riders comprising Felipe, Suaza, Abdulrohma (KFC) and John Ebsen (Forca Amskins) lanched an attack after just 26 kilometres and took all the points at the first categorised climb (CAT 3) in Gerik, before Suaza took the second summit at Titiwangsa (CAT 1) after 67 kilometres, before being joined by a larger group. The front group then managed to stay intact, despite several breakaway attempts at the intermediate sprints in Batu Melintang, Bukit Bunga and Rantau Panjang, leaving the second group 13 minutes behind at the finish. Stage 3 of the race tomorrow will be a flat throughout, without any categorised climbs, covering a route of 166km from Kota Baru to Kuala Terengganu, with three intermediate sprints slated at Jelawat, Kuala Besut and Pantai Penarik before the finish line at Jalan Sultan Zainal Abidin in Kuala Terengganu. 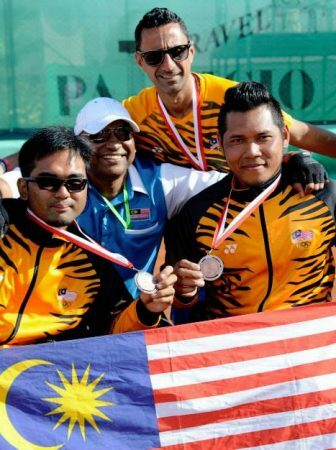 The UCI 2.HC status race, covering an overall distance of 1,341.2 km throught eight states in Peninsula Malaysia, will see 22 teams competing for honours. LTdL 2018 is organised by Ciclista Sports with the full support of the Ministry of Youth and Sports.